A new year brings new expectations and plans. Many of those plans include the desire to eat less, work out more and overall be healthier. Starting next month, there will be some new options to help people do just that. Workout Anytime is preparing to launch its new Elizabethton location in the coming weeks. Jim and Charity Smith opened their first location in Asheville a little over a year ago. Now they are expanding into Elizabethton, bringing their small-community-oriented business model to the Tri-cities. Jim and Charity Smith, co-owners of the brand, said their first Asheville location came from a desire to better their communities. The business has expanded over the past year, a goal the couple said they have had since the business’s inception. “We wanted to do more than one from the very start,” Mrs. Smith said. So far, the company has focused on a two-hour circle from Asheville in their expansions. They decided Elizabethton had a need for the services and benefits their fitness center provided. The gym is not just for exercise. The Smiths said they also offer tanning and HydroMassage, a special kind of massage unit that uses warm water. 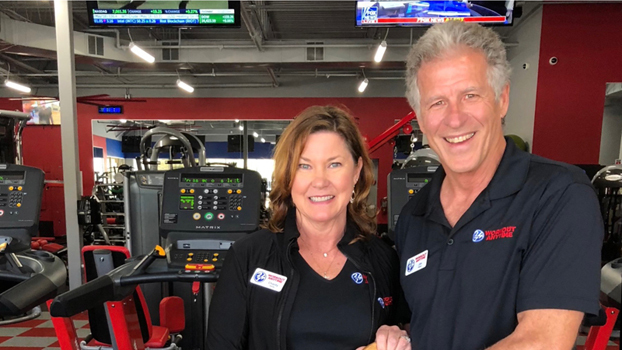 Workout Anytime is not the only fitness center in Elizabethton, and at least one even shares a similar name, but the Smiths said the quality of their services surpass the others. “We host small group classes, we have a friendly staff and we have a clean gym,” Mrs. Smith said. The fitness center will be open 24 hours a day, any day, fulfilling what they called their motto. The new location will open at 619 West Elk Avenue, near Ingles; and will open near the end of February. Those who cannot make the event can still sign up for a membership online starting that day. They said they work to bring people together as they work to promote healthier lifestyles. “You belong to one, you belong to all,” Mrs. Smith said.